Guarana, hailing from the Amazon rainforest, is a stimulant herb with several potential health benefits. Explore its fascinating history and various uses. Guarana, which originated in the South American jungle, is a climbing plant that has enjoyed popularity in the culinary world for centuries. Its importance can be traced back to the Satere Maue, an Amerindian native tribe belonging to the Guarani-Tupi language family. Its origin was originally explained by them through myth and religious lore, whereby a god offered guarana seeds to villagers as reparation for the murder of a village child at the hands of a more maleficent deity. Ever since, the Satere Maue seem to have relied on the different energizing and brain-enhancing properties of guarana seeds. Combating fatigue. Guarana exerts an stimulating effect in the human body, promoting physical endurance and alertness. Increasing concentration. Because of its particular composition, guarana heightens concentration and attention span. Relieving pain. Its analgesic properties help reduce the pain caused by migraines and headaches. Speeding up metabolism. Guarana has shown to increase the metabolic rate and suppress hunger, thus contributing to a well-balanced weight loss plan. The main active compound in guarana is guaranine, a compound chemically identical to caffeine that is found abundantly in the seeds and fruit of the guarana tree. Much of the remaining nutritional value of guarana is similar to that of coffee (Coffea arabica), and it contains roughly the same balance between tannins, protein, starches, and fat. Just like caffeine, guaranine blocks adenosine receptors in the brain, reducing the effects of dopamine (one of the neurotransmitters produced by the brain) and slowing down the onset of fatigue symptoms. Therefore, it can heighten concentration, focus, and energy; it also seems able to increase resistance to pain. Guarana speeds up heart rate, providing a mild boost to a person's basal metabolic rate (BMR), and it suppresses the feeling of hunger and cravings. Coffee and mate also provide analgesic and stimulant benefits. Potential serious side effects of guarana may include anxiety or panic reactions, confusion, dizziness or fainting, irregular breathing, palpitations, muscle twitching, nausea and vomiting, seizures, and trembling. Mild side effects include diarrhea, frequent urination, headache, nervousness, restlessness, or stomach upset. It is advised to consult a healthcare professional before taking guarana, especially for those suffering from health conditions such as angina, anxiety, chest pain, diabetes, heart disease, irregular heartbeat, high or low blood pressure, kidney disease, liver disease, panic attacks, peptic ulcer disease or colitis, seizure disorder, thyroid disease, and sleep disorders. Likewise, women who are pregnant or breastfeeding should avoid the consumption of guarana. Guarana is the main ingredient in a popular Brazilian soft drink, which has then been successfully adapted across South America and in Portugal. Guarana is popular for its high caffeine content and sweet, slightly tangy taste. It is locally consumed in juices and also used in the beverage industry for its energy-boosting properties. Those with access to fresh guarana fruit or its seeds may also try making their own home remedies; however, the easiest way to reap the health benefits of guarana is in supplemental forms, which are widely available. Infusion. 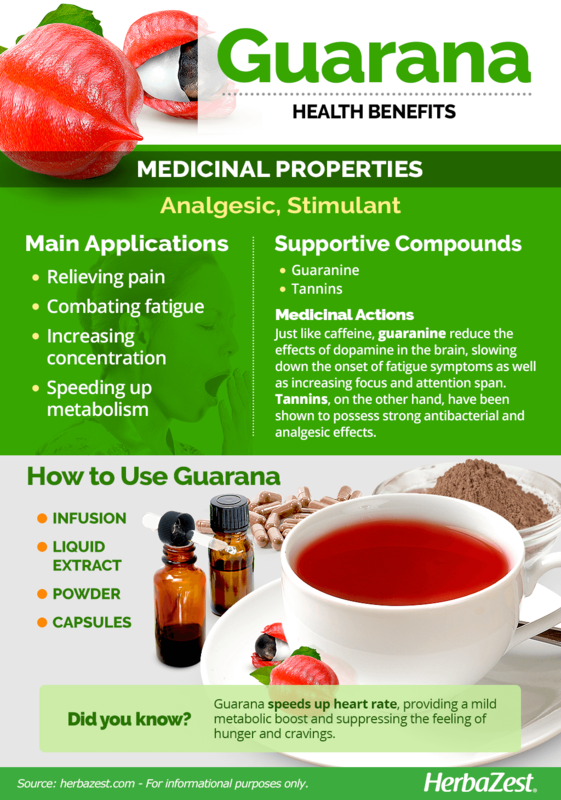 The dried leaves of guarana can be brewed into an herbal tea for a gentle relief of fatigue and headaches. Powder. This popular energy supplement, from the dried and ground guarana fruits and seeds, can be mixed into juices and smoothies. Liquid extract. This concentrated form of guarana needs to be diluted in water in order to extract its stimulant and analgesic properties. Capsules. The caffeine-like content of guarana comes in convenient doses for a daily energy-boost and improved cognitive response. The extract of guarana seeds is a common ingredient in many soft drinks. Fresh guarana is still not commonly sold in food markets, but it can be purchased over the internet. It is most commonly sold as a ready-made beverage or in powdered form. Likewise, the dried leaves and seeds of guarana are mainly found through online retailers. Guarana supplements are mainly found in specialized health stores. In addition, guarana supplements can be purchased online. Each brand may come with different concentrations, so read labels carefully. They are overwhelmingly more common in caplet form and made from powdered guarana seeds. Consumers should exercise caution when purchasing a supplement, as not all manufacturers follow proper practices. 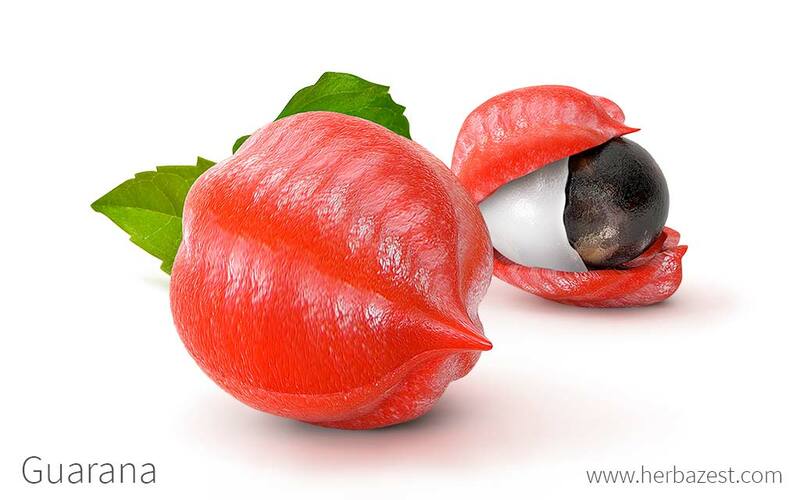 GUARANA SUPPLEMENTS ARE MAINLY FOUND IN SPECIALIZED HEALTH STORES AND ONLINE RETAILERS. Guarana cultivation still takes place predominantly in the tropical region of the Amazon jungle. In order to cultivate guarana in a home garden, similar humid conditions and constantly hot temperatures are necessary. The guarana tree prefers an average temperature of 70°F (21°C), though it can tolerate lows as sharp as 54°F (12°C), provided they are sporadic and short-lasting. It prefers deep, acidic soils rich in organic matter. The plant has a minimum annual rainfall requirement of 55 inches (1,400 mm). Since it is accustomed to the complex ecosystems of the Amazon jungle, it makes a good companion for other crops or timber in an agroforestry system. Guarana vines produce small fruits, typically arranged in clusters or handfuls, which are usually bright red or intense orange. These brightly-colored fruits allow both animals and humans to locate and pick them easily, since they stand out quickly in their overwhelmingly-green habitat. Guarana is a member of the Sapindaceae family, which includes approximately 2,000 species of flowering plants. Among the most famous ones, sugar maple (Acer saccharum) and lychee (Litchi chinensis) are worth mentioning. The guarana plant does not have any varieties or subspecies that botanists have identified to date. However, its prized fruits can range in color from brown to red. Guarana was introduced to European herbalists via European colonies established in the 16th century, in particularly the Jesuit-ran Misiones on the Southern edge of Brazil. However, it did not become widely commercialized around the worldwide until the 20th century, and now it is regarded as a commodity product throughout most of the subcontinent. The most economically-important aspect of guarana lies in the high percentage of guaranine found in its seeds, which has made it a popular addition to many traditional soft drinks, especially in South America. However, the true economic boom of guarana came after the development of the energy drink industry, which appeared in the late 1990s and is now worth billions of dollars, supporting a wide variety of manufacturers. The biggest producer of guarana in the world is currently Brazil. Aphrodisiac. Guarana has been used as an aphrodisiac for hundreds of years, although any evidence beyond anecdotal reports in this matter is lacking. Fish bait. The guarana plant's roots, leaves, and stems are also used as fish bait in Central and South America.